This paper is written in the light of a hermeneutic of faith or through the eyes of faith, as described by Joseph Cardinal Ratzinger (Pope Benedict XVI).4 This paper reflects on the literal sense of Genesis 3, and how Genesis 3:15 fits within the context of the primeval story of creation.5 The New Testament writers and the Fathers of the Church provide the spiritual sense of the passage.6 Genesis 3:15 establishes the trajectory of salvation history and achieves fulfillment in Jesus Christ. that there it may be a witness against you." Jesus of Nazareth, the son of Joseph." יהוה אֱלֹהִים or Yahweh Elohim - Lord God, beginning at verse 2:4 and throughout Chapters 2 and 3. God placed our first parents, Adam and Eve, in the Garden of Eden, with trees of every kind of fruit that were pleasing to the eye and good for food. In the middle of the Garden were the tree of life and the tree of knowledge of good and evil. The Lord God commanded the man, saying, “From any tree of the garden you may eat freely; but from the tree of the knowledge of good and evil you shall not eat, for in the day that you eat from it you will surely die” (Genesis 2:16-17). But Adam and Eve break their relationship with God by their sin - חַטָּאת - hattat of disobedience in Genesis 3. Their fall leads to punishment and eventual expulsion from the Garden. Even so, God showed mercy in Genesis 3:15 when he speaks of someone in the future who will "crush the head of the serpent." This is a sign of God's love for his creation; in spite of man's disobedience, he gave mankind hope for the future. God punished Cain after he killed Abel, and told him "the ground is cursed because of you." But then God mitigated his punishment and afforded Cain protection by placing a mark on him (Genesis 4:8-15). Sin continued to spread to such a point that even the heavenly ones breached the natural order by taking earthly wives (Genesis 6:1-4). God regretted he had made the human race and was going to "blot out" man, but then he found favor with Noah (Genesis 6:6-8). God delivered Noah from the Flood in the ark. Even though men created the Tower of Babel, God blessed the generations of Shem and gave Terah a son named Abram (Genesis 11:26). and she also gave some to her husband, who was with her, and he ate." The chapter begins with the serpent, who suggests to the woman to eat of the Tree of Knowledge of Good and Evil (verses 1-5). The serpent cleverly tells the woman that if she eats the fruit of the forbidden tree, "you will be like God." There is a subtle but significant change in the naming of God by the serpent - he called God simply Elohim and not his proper name, Lord God (Yahweh Elohim). The woman then echoes the serpent by also calling God Elohim in 3:3. The woman succumbed to the serpent's lie and ate of its fruit and gave the fruit to אָדָם - Adam, the word for both "Adam" and "man" - and he ate. The narrative structure of Genesis 3 offers insight into the meaning of the text. In his investigation of what happened, the Lord God first questions Adam and then Eve (verses 8-13). God does not question the serpent. But he renders punishment in opposite order - first to the serpent, then to the woman, and then to the man. This sequence parallels the order of appearance in the narrative in Chapter 3. The serpent appears first in the chapter, and is named first in the series of punishments - he is the first to blame, as he was the instigator. The woman is the one who appears second, and the third in appearance is Adam, and he is the last to be punished. You will crawl on your belly and you will eat dust all the days of your life." One cannot help wonder at this point - who is the serpent? The serpent speaks, the only animal that does so in the primeval story of creation. The serpent tempts the woman to be disobedient to the Lord God. The serpent "demotes" God by calling him Elohim and not Yahweh Elohim as the narrator. The serpent actually infers that God is a liar - "No, you will not die..." (v 3:4). Is the serpent just a clever animal? and they who are in his possession experience it." he was thrown down to the earth, and his angels were thrown down with him." This passage is striking! A message of hope is given humanity, for, even though God begins to punish the offenders, he speaks of mankind having offspring - so his blessing on future generations of mankind has not been removed. This is in itself a declaration of mercy. God informs the serpent he will put enmity between the serpent and the woman. This is reinforced by the second part of the sentence, “between your offspring and hers.” The Hebrew word זֶרַע - zera - is the same for “offspring” and “seed”, accounting for the difference in English translations, but in both cases the word is masculine. In summary, Genesis 3:15 has a prophetic nature to it, for there is promise of a redeemer in the future, that one will crush the head of the serpent. God's judgement upon the serpent contains a promise of ultimate victory through the woman by her offspring. This spiritual sense will be revealed throughout Scripture and the Fathers of the Church. God then sentences the woman (3:16): "I will greatly multiply your pain in childbearing; in pain you shall bring forth children, yet your desire shall be for your husband, and he shall rule over you." God continues with the punishment of Adam (3:17-19): "Because you have listened to the voice of your wife, and have eaten of the tree of which I commanded you, ‘You shall not eat of it,’ cursed is the ground because of you; in toil you shall eat of it all the days of your life; thorns and thistles it shall bring forth to you; and you shall eat the plants of the field. In the sweat of your face you shall eat bread till you return to the ground, for out of it you were taken; you are dust, and to dust you shall return." The first appearance of the word "bread" - לֶחֶם - lehem - in the Bible occurs here in Genesis 3:19 in the punishment of Adam. Who is the woman? Adam calls her “woman” - אִשָּׁה - ishah - until he names her Eve - חַוָּה – hawwah - in Genesis 3:20, the "mother of all the living." St. Matthew, in speaking of Mary being with child, sees fulfillment in Jesus Christ of two Old Testament prophecies of the Messiah, that of Isaiah 7:14, that the Messiah would be born of a virgin, and Micah 5:1-4, the Christ would be born in Bethlehem (Matthew 1:20-2:6). "O woman, what have you to do with me? "Do whatever he tells you. As Jesus was dying on the cross, he called out to his mother, "Woman, behold your son" (John 19:26) . St. Paul addressed original sin, and calls Adam "a type of the one to come," referring to Christ in his Letter to the Romans. The word for Adam and man is the same in Hebrew, and Jesus called himself the Son of Man. but sin is not counted where there is no law. who was a type of the one who was to come. Then the God of peace will soon crush Satan under your feet. For since death came through a human being, the resurrection of the dead came also from a human being. For just as in Adam all die, so too in Christ shall all be brought to life. and free those who through fear of death had been subject to slavery all their life. that he might be a merciful and faithful high priest before God to expiate the sins of the people. One may see in an overview that the Books of Genesis and Revelation, the first and last books of the Bible, serve as bookends to the whole of salvation history, the triumph of God through his Son Jesus Christ. The concept of Genesis 3:15 being the Proto-evangelium or "First Gospel" is attributed to St. Irenaeus of Lyons (135-202) from his work Against Heresies: 22 "For this end did He put enmity between the serpent and the woman and her seed, they keeping it up mutually: He, the sole of whose foot should be bitten, having power also to tread upon the enemy's head; but the other biting, killing, and impeding the steps of man, until the seed did come appointed to tread down his head, - which was born of Mary, of whom the prophet speaks: 'Thou shalt tread upon the asp and the basilisk; thou shalt trample down the lion and the dragon (Psalm 91:13).'" "Christ has therefore, in His work of recapitulation, summed up all things, both waging war against our enemy, and crushing him who had at the beginning led us away captives in Adam, and trampled upon his head, as thou can perceive in Genesis that God said to the serpent, 'And I will put enmity between thee and the woman, and between thy seed and her seed; He shall be on the watch for thy head, and thou on the watch for his heel.' For from that time, He who should be born of a woman, namely from the Virgin, after the likeness of Adam, was preached as keeping watch for the head of the serpent. This is the seed of which the apostle says in the Letter to the Galatians, 'that the law of works was established until the seed should come to whom the promise was made (Galatians 3:19).' This fact is exhibited in a still clearer light in the same Epistle where he thus speaks: 'But when the fullness of time was come, God sent forth His Son, made of a woman (Galatians 4:4).' For indeed the enemy would not have been fairly vanquished, unless it had been a man born of a woman who conquered him. For it was by means of a woman that he got the advantage over man at first, setting himself up as man's opponent. And therefore does the Lord profess Himself to be the Son of man, comprising in Himself that original man out of whom the woman was fashioned, in order that, as our species went down to death through a vanqushed man, so we may ascend to life again through a victorious one; and as through a man death received the palm of victory against us, so again by a man we may receive the palm against death." Genesis 3:15 is a promise, a message of hope for mankind. God created this world and retains dominion over the world. God will not let the force of evil prevail, but will deliver mankind from its grip. God punished our first parents for their disobedience, but as a sign of his mercy, preserved his blessing of future generations. 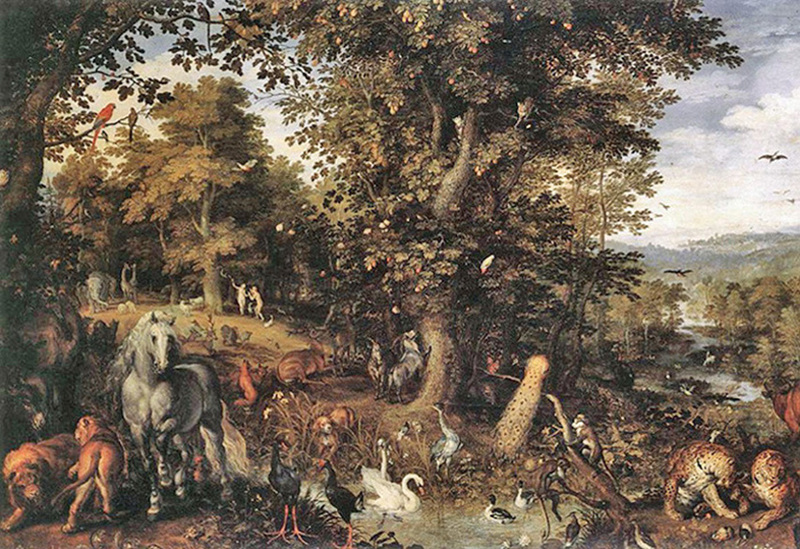 The expulsion of Adam and Eve from the Garden of Eden is mitigated by hope of an offspring of the woman. The primeval story of creation presents God retaining dominion and relationship with his creation in spite of man's disobedience and fall. Ever since Adam and Eve, there has been a struggle between good and evil. Adam and Eve were led to the sin of disobedience, when the serpent achieved victory by leading our first parents astray. But after pronouncing punishment, the Lord God mitigated the sentence by promising an offspring of the woman, a son of man to crush the head of the serpent in Genesis 3:15. God does not give up on his creation! New Testament Scripture and the Church Fathers saw Jesus Christ as the New Adam, the Son of Man, the offspring of Mary the New Eve. Jesus died on the Cross to fulfill his Father's will, triumph over death, and redeem mankind. Genesis 3:15 sets the course of salvation history throughout the Bible and finds fulfillment in Jesus Christ. 1 Andrew Minto. Genesis 1-11: Exegesis and Patristics. Class Lectures and Notes, Franciscan University, Steubenville, Ohio, 2004. 2 The Hebrew Bible. Biblia Hebraica Stuttgartensia. Masoretic Text, Fifth Edition. Deutsche Bibelgesellschaft, 2006. 3 JPS Hebrew-English Tanakh. Philadelphia: Jewish Publication Society, 2000. 4 Joseph Cardinal Ratzinger. "Foundations and Approaches of Biblical Exegesis." Origins 17 (35): 593-602, February 11, 1988. 5 The Second Vatican Council. "Lumen Gentium" and "Dei Verbum," in Vatican Council II, Austin Flannery (ed): (New York: Dominican Publications, Costello Publishing Company, 1996), 416, 750-765. 6 Pontifical Biblical Commission. The Interpretation of the Bible in The Church. (Boston: Pauline Books & Media, 1993), 82-88. 7 Navarre Revised Standard Version of the The Holy Bible. Dublin, Ireland: Four Courts Press, 1999-2005. 8 Gary A Rendsburg. "Ancient Hebrew Morphology," in Kaye AS (ed), Morphologies of Asia and Africa (Winona Lake, Indiana: Eisenbrauns, 2007), 85-105. 9 Gary A Rendsburg. "A New Look at Pentateuchal HW'." Biblica 63 (1982): 351-369. 10 Gary A Rendsburg. The Redaction of Genesis. Winona Lake, Indiana: Eisenbrauns, 1986. 11 Pope John Paul II. "Original Unity of Man and Woman," in Theology of the Body - Human Love in the Divine Plan, (Boston: Pauline Books & Media, 1997), 32-93. 12 Sofia Cavalletti. The History of the Kingdom of God, Part I: From Creation to Parousia. (Chicago: Catechesis of the Good Shepherd, Liturgy Training Publications, 2012), 42-60. 13 Allen P. Ross. Introducing Biblical Hebrew. Grand Rapids, Michigan: Baker Academic, 2001. 14 Umberto Cassuto. A Commentary on the Book of Genesis. (Jerusalem: Magnes Press, Hebrew University, 1978), 138-162. 15 Allen P. Ross. Creation and Blessing: Guide to the Study and Exposition of Genesis. (Grand Rapids, Michigan: Baker Books, 1996), 130-151. 16 St. Augustine. The Literal Meaning of Genesis. Book XI, Chapter II. (New York: Ancient Christian Writers, 1982), Vol 42:135-136. 17 Andrew Minto. Genesis 1-11: Exegesis and Patristics, 2005. 18 Menahem Mansoor. Biblical Hebrew - Step by Step, Volume One. Grand Rapids, Michigan: Baker Book House, 1980, 24th Printing, 2007. Volume Two, Third Edition, 1984, 13th printing, 2002. 19 Father George T. Montague. The Apocalypse. (Ann Arbor, Michigan: Servant Publications, 1992), 141-150. 20 Nancy Guthrie. The Promised One: Seeing Jesus in Genesis. (Wheaton, Illinois: Crossway, 2011), 61-85. 21 St. Justin Martyr. "Dialogue with Trypho", Chapter 100, in Fathers of the Church. New York: Christian Heritage, 1948. 22 Pope John Paul II. Theology of the Body - Human Love in the Divine Plan, (1997), 93, 458-460. 23 Irenaeus of Lyons. Against Heresies - Book III, Chapter 23, 7, in The Apostolic Fathers, Coxe AC (ed). Edinburgh: American Edition of the Ante-Nicene Fathers, 1885; and Book V, Chapter 21, 1, in Ancient Christian Commentary on Scripture: Genesis 1-11, Andrew Louth (ed). (Downers Grove, Illinois: InterVarsity Press, 2001), 90-91. 24 Andrew Minto. Genesis 1-11: Exegesis and Patristics, 2005. 25 Pope Pius IX, Ineffabilis Deus, December 8, 1854, on Welcome to the Catholic Church on CD-ROM, Gervais, Oregon: Harmony Media, 2005. 26 Pope Pius XII, Munificentissimus Deus, November 1, 1950, on Welcome to the Catholic Church on CD-ROM, Gervais, Oregon: Harmony Media, 2005. 27 Pontifical Biblical Commission, The Interpretation of the Bible in The Church, 82-88. 28 Gordon J. Wenham. World Biblical Commentary: Genesis 1-15. (Waco, Texas: Word Books, 1987), 80-91. 29 Pope John Paul II. God's Yes to Man - The Encyclical Redemptoris Mater. San Francisco: Ignatius Press, 1988. 30 Catechism of the Catholic Church, Second Edition. Libreria Editrice Vaticana, (Washington, DC: US Catholic Conference, 2000), Paragraphs 115-119, 410.